Yesterday when I was reading twitter, (which is every hour that I’m awake) somebody retweeted the picture below onto my timeline. It’s safe to say I was a little pissed because once again, we have another lazy media person who figured they’d take a shot at Philly fans. 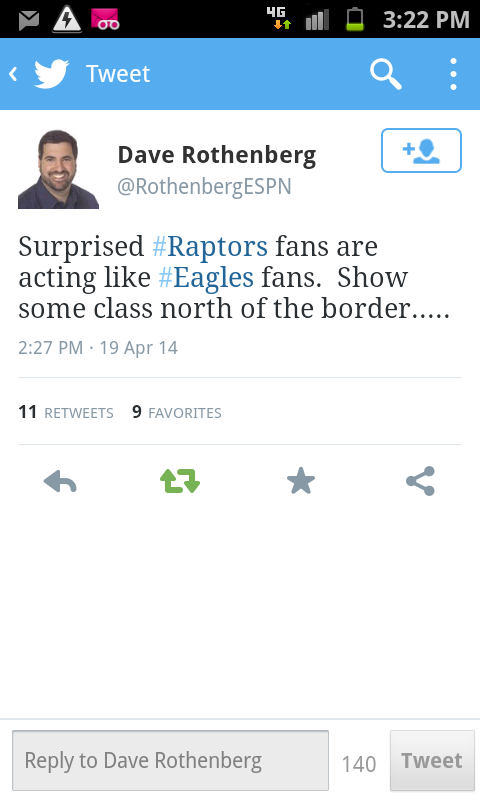 I nicely sent Mr. Rothenberg a tweet after reading this and of course I got no response. 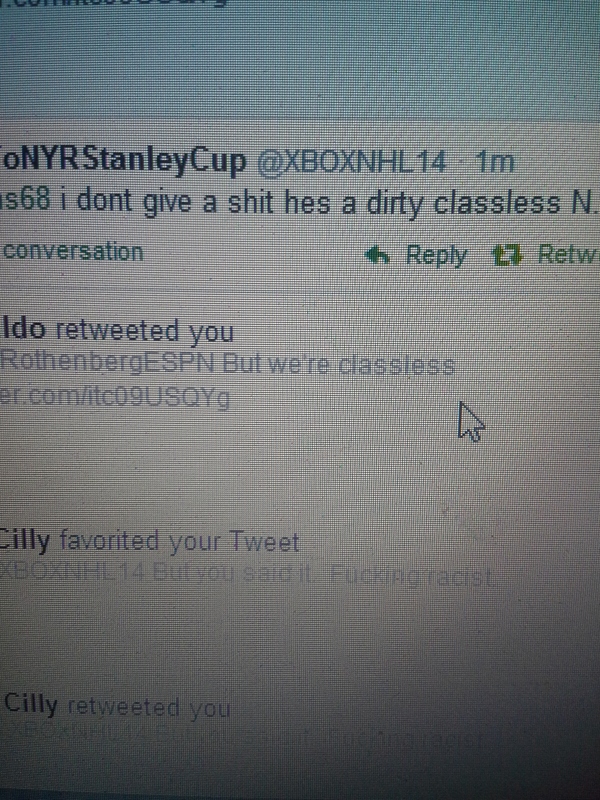 Today when I was watching the Flyers/Rangers game, Rangers fans (with all the class they have) decided they were going to boo an injury so I tweeted Rothenberg again and got the response, “right.” Nice answer. 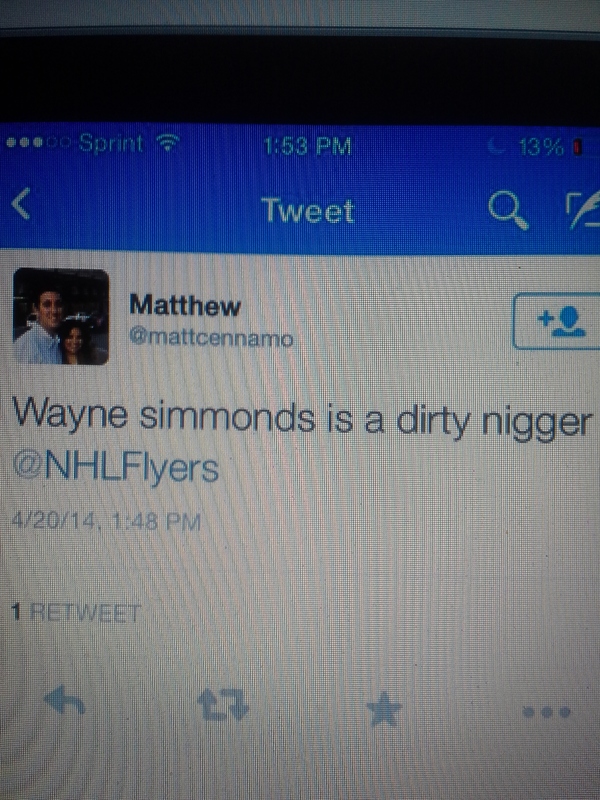 As the game was going on, some of my followers started retweeting racial tweets from Rangers fans about Wayne Simmonds. Being the person I am, I decided to tweet these pictures and a few more to my old friend Rothenberg so he can see who really has the classless fans. Guess what, I got no response. It makes me sick in my stomach that Philly fans get killed for booing Santa and throwing snowballs but the media never has anything to say about things like what’s in the above pictures. Oh, I’m sorry, they do make a big deal about it when a football player from Philly gets caught on video saying it, then it’s headline news for 3 months. It makes me sick in my stomach that as a half black woman, in this day and age, I still have to see this word used as a derogatory way of putting black people down. It makes me sick in my stomach when people tell me I need to get over it. Get over it? Yea I’ll get over it when racist jackasses like the 2 above don’t exist anymore. I don’t want to get deep into the use of the N word because all I am trying to do in this post is prove that there are fan bases out there who do or say worse things than Philly fans but I guess it’s ok in the eyes of the media to call someone the N word as long as you’re not throwing snowballs at them at the same time. Sorry the pictures aren’t clear but you get the point.